I nearly set this one down about a third of the way through. The violence just seemed gratuitous, played for yuks (and for yucks), divorced from anything meaningful going on in the story. I stuck with it because I was curious about some of the characters and, to be honest, because the book isn’t that long and moves at a good clip. Carolyn’s life was more or less normal for its first eight years. Then one day a fireball engulfed much of her neighborhood, incinerating her home, orphaning her and about a dozen of the other neighborhood children. They are all adopted by an eccentric neighbor, Adam Black, who turns out to be much more than he seemed. After that, things get weird. Clearly, these are not ordinary librarians. Nor indeed is it a normal Library. As Carolyn reveals in the opening chapter, each of the orphans has a special area of study. Hers is languages: all of them. Her adoptive brother David’s is war; Michael’s is animals; Jennifer’s is healing; Margaret’s is death. She’s not completely mad, but returning from the dead so many times has certainly taken its toll. Time flows differently in the Library, and though the librarians appear to be in their early 30s, each has had enough study to master their portfolios. One of Carolyn’s earliest lessons was a summer spent among the deer, learning the languages of the forest creatures. Each librarian is a specialist, for their Father does not countenance learning outside of one’s catalog. Deviation is punished, and with resurrection readily available, death is not the harshest that he metes out. Carolyn hates him, and has determined to kill him, with a plot so subtle that she dare not even think about it much, lest he or David glean what she is up to and put a gruesome stop to it. The librarians are not quite human anymore, and their half-comprehending interactions with contemporary America provide much of the book’s humor. It’s also fun to find out how far their powers extend, and the deadly competition among them provides much of the book’s tension. There was also enough horribleness going on that I considered not continuing. What I liked most about the book is that it does not end where one would expect it to. 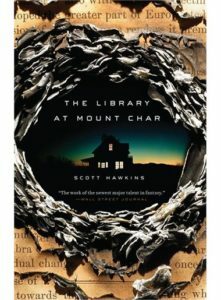 The Library at Mount Char reaches that point, and then it keeps going. The most interesting part of the book is not the resolution of its main conflict, but what happens afterward. The main struggle is full of fireworks and twists, but structurally it’s also very straightforward, and you either enjoy the ride or you don’t. After, though, is what I did not expect, and what made me most glad that I had not set it down when it looked like it was just going to be a weirdly giddy gorefest.